Ibéria & España. Isaac Albéniz. Dover Publications. 1987. ISBN 0486253678 (paperback). 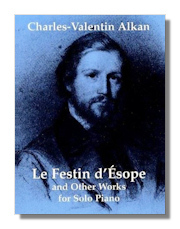 Authoritative editions of two well-know works for piano. 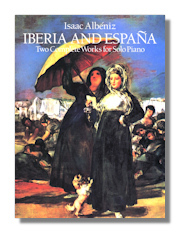 Ibéria is a collection of 12 musical scenes of Spanish life & España is made up of 6 piano pieces including "Tango". Complete Works for Voice and Piano. Isaac Albéniz. Tritó Edicions. 1998. ISBN 8488955413 (paperback). Albéniz's piano music generally overshadows the rest of his output. In his songs and lieder however, we find a variety of different pieces, from the salon romanza to the French impressionist-style song, alongside recited texts with piano accompaniment. The collected edition of these songs, some of them previously unpublished, sheds new light on this composer. Le Festin d'Ésope. Charles-Valentin Alkan, with Marc-André Hamelin (Editor). Dover Publications. 1998. ISBN 0486400662 (paperback). Selected and with Introductory Notes by Marc-André Hamelin. This unprecedented collection rescues extraordinary, challenging piano works from undeserved obscurity. Contains: Études in Minor Keys, Op. 39 (the complete Symphony for Solo Piano, Op. 39, #4-7; the complete Concerto for Solo Piano, Op. 39, #8-10; & "le Festin d'Ésope" (Aesop's Feast), Op. 39 #12); Saltarelle, Op. 23; Barcarolle, Op. 65, #6; & Toccatina, Op. 75.